Autism affects more than 1 million children and adults in the United States, and parents may be confused by the behavior of autistic children. 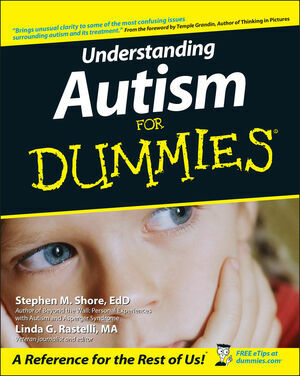 This book provides help-and hope-by explaining the differences between various types of autism and delivering the lowdown on behavioral, educational, medical, other interventions. Featuring inspiring autism success stories as well as a list of organizations where people who support those with autism can go for additional help, it offers practical advice on how to educate children as well as insights on helping people with autism use their strengths to maximize their potential in life. Stephen Shore, EdD (Brookline MA), serves on the board for several autism spectrum-related organizations and he has written Beyond the Wall: Personal Experiences with Autism and Asperger Syndrome (1-931282-00-5) and edited Ask and Tell: Self Advocacy and Disclosure For People on the Autism Spectrum (1-931282-58-7). Linda G. Rastelli (Middletown, NJ) is a veteran journalist who specializes in health and business. Temple Grandin, PhD (Fort Collins, CO) is the author of the bestselling Thinking in Pictures (0-679-77289-8) and Emergence: Labeled Autistic (0-446-67182-7). Stephen M. Shore received a regressive autism diagnosis at age 18 months, became nonverbal, and was deemed “too sick” to be treated on an outpatient basis. Today, he’s finishing a doctoral degree focused on helping people with autism lead fulfilling and productive lives. When not teaching college-level courses in special education and teaching children with autism how to play musical instruments, he consults and presents on autism-related issues internationally. Some topics of particular interest to him include comparative approaches for helping people with autism, education, and disaster preparedness for people with disabilities. He also focuses on challenges faced by adults in terms of self-advocacy, disclosure, post-secondary education, employment, interdependent living, and relationships. Stephen holds bachelor degrees in music and accounting and information systems from the University of Massachusetts at Amherst. He also holds a masters degree in music education and is on the cusp of finishing his doctorate in education from Boston University. Although he seems to spend most of his time traveling in airplanes (Boeing 747-400 preferred), he resides in Brookline, Massachusetts, with his wife on the rare occasions when he’s home. Linda G. Rastelli is an award-winning journalist, instructional designer, and author with 20 years of experience in writing and designing instruction for health, education, and business topics. In her career, she has focused on making complex and technical information understandable to the layperson. Although she has covered subjects ranging from financial ratio analysis to educational reform, her most challenging inquiry to date — an undertaking that has made her other projects look like finger painting in comparison — has been autism. Linda holds a bachelor of arts degree from the University of Delaware and a masters degree from Columbia University. She lives on the New Jersey coast with her husband and her cat, who have reached a blissful state of detente. She hopes to keep her day job.